I’ve mentioned this pitch in a couple of other posts, but it deserves its own. This is the tarp pitch I use most often. The video below doesn’t name it and it isn’t listed in David Macpherson’s encyclopedic collection of tarp pitches, so I call it “The Cave”. I learned the pitch from this YouTube video about pitching an 8×10 Etowah tarp. The video is short and clear, less than two minutes, and it is much better than reading a description. Watch carefully, you do not stake the rear corners. You stake midway between the center and the corners. I don’t pitch it self-standing like the video, instead I use a front guy line and throw a clove hitch around the top of my trekking pole. Still, it is easy for a single person to set up. My tarp is an Integral Designs Siltarp 2, an 8×10 tarp. 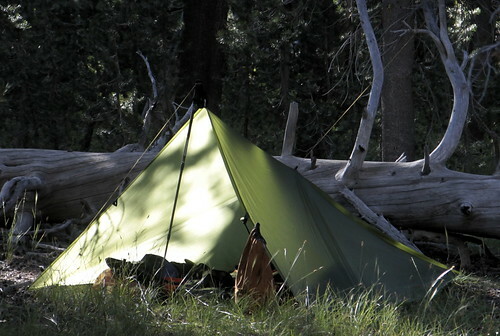 In bad weather, a 10×10 tarp would provide a deeper cave and more coverage. Or you could pitch a poncho over the open end. 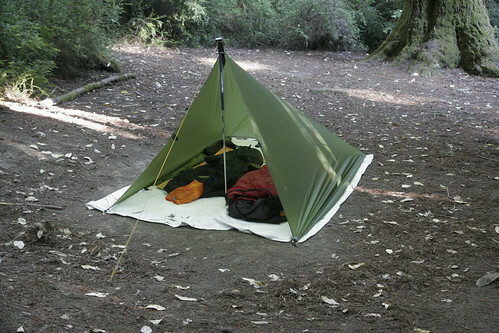 Here it is, set up at Jay Trail Camp in Big Basin State Park, when my son and I were hiking Skyline to the Sea. As you can see, there is a decent amount of room inside, though I wouldn’t call it spacious for two. Here, my son is using a trekking pole to raise the ridge line. 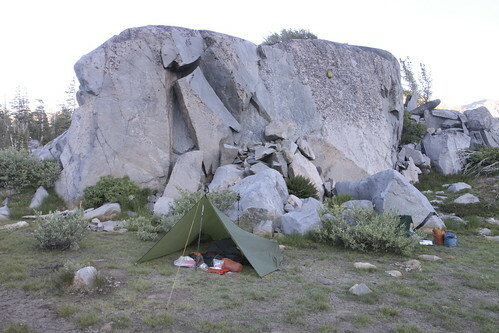 That would work if you had a Tundra Tarp with their quad-loop pole grabber, but it didn’t work for us. The pole just wouldn’t stay put. Besides, it was in the way. I recommend an external guy line from the center pull-out with a trekking pole to get some height—there is photo of that later. And here I am the next morning. I’m 6’3″, so you can get a feel for the coverage. Not enough to keep rain from blowing in the front, but it sure keeps the breezes under control. At Bonnie Lake in the Hoover Wilderness, we camped in a windy, exposed site. This was pitched cross-wise to the wind (I liked the view). It got down to 34º and there was a stiff breeze all night. If you look carefully in the photo or click through to the big version, you can see that I’ve set up my other trekking pole beind the pitch to pull the center tie-out up and make more room. Extra credit for spotting the bear bag. At Lower Paiute Meadows later in the same trip, I found a sheltered spot with a nice tall branch on the downed tree for the back pull-up line. Give this a try, it is easy to pitch single-handed once you get the hang of it. 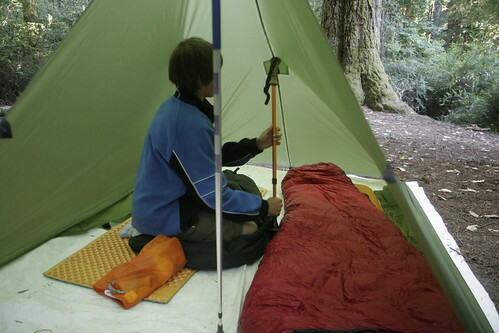 You can even pitch it in the wind, because the tarp is staked securely to the ground before you raise the pole. 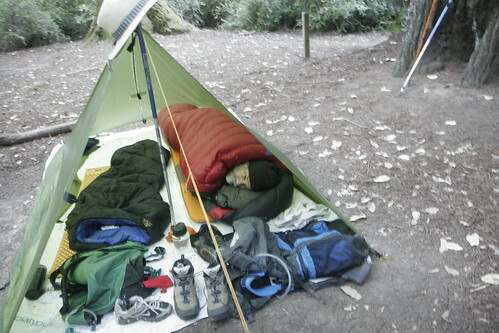 This entry was posted in Backpacking & Hiking, Scouts BSA. Bookmark the permalink.